To love someone deeply gives you strength and to be loved deeply by someone gives you courage. This is so true.Its my hubby’s love that gives me courage to do want I want. Loving him gives me the strength to overcome any difficulties. My hubby has never been the flowers, chocolates, teddy bear type of person. Yesterday after watching Raees we went for lunch to a famous Italian restaurant. We were sitting next to the very tempting choices of gelato but he didn’t ask me if I wanted some as Valentine’s Day is around the corner. In all our 34 years of marriage I received only one valentine’s card from him and that too when he was away doing his dermatology course. I bet the younger college mates and friends must have advised him to do so. Basically what I’m trying to get across to you all that he is not the romantic type, he’s just too practical and serious. So you may ask “Why don’t I do something special?” Well, it usually will go unnoticed, or I would be told why go through all the trouble. Take for example the pudding I made for this post. I took some time and patiently cut out heart shapes from the jelly(not easy when the kitchen’s really hot!) and placed a heart on the pudding. The pudding was devoured without any mention of the heart bang in the middle! No ‘wow’ or ‘so sweet’! Well that doesn’t mean he doesn’t love me. He has a different way of showing his love and care. I have to look for it and understand it from his every day actions and decisions he takes. It was his suggestion to go and see Raees, not because he loves watching hindi movies( he’d prefer the English action ones) but because he knows that I love watching hindi movies. Choice of an Italian restaurant is not for him but more for me as I love Italian cuisine. Walks on the beach, dipping our feet in the sea, sitting at the quaint little restaurant at Cowrie Shell, taking care of me when I fall sick, ordering food when I don’t feel like cooking, carrying my bags when we travel, carrying my shopping bags, giving me the best seat on the plane etc. are his ways of showing his love for me. Our is an arranged marriage and sure we’ve had our shares of ups and downs. Over the years love has grown to such an extend that it hurts to be apart for a period of time. When I was away in Bangalore preparing for my daughter’s wedding, I missed him everyday though we skyped, facetimed and called every day, sometimes twice in a day. So for me love is when I can feel his pain, when I can sense he is thinking deeply, when I know something is bothering him, when I can’t bear to see tears in his eyes, when I can rejoice with him and share good times and bad times, I can joke with him, tease him and scold him too. We’re are poles apart in many ways but we’ve both accepted each ones passion and traits and worked around them. If that is not love than what is it? Love for us doesn’t mean roses, chocolates, candle light dinners or gifts. Its the every day little things we do for each other. Sure, I’ll prepare his favourite dish on Valentine’s Day. Today’s recipe is a simple milk pudding served with jelly. I had previously tried this pudding using a whole sweetened condensed milk tin with the milk. The pudding turned out just too sweet. So this time I reduced the condensed milk, added sugar according to my taste. This recipe is my contribution for the 79th theme – Valentine theme for #FoodieMonday #Bloghop group. Prepare the jelly as instructed on the packet. Set it in a tray. You want the set jelly to be about 1″- 2″ in height. Sprinkle the agar agar flakes or powder over the water in a small pan and mix.Let it rest for 15 minutes. Mix milk, condensed milk and sugar in a deep pan. Put the pan with milk over medium heat till it begins to boil. Stir the milk frequently. Put the hot milk pan on the side. Heat the agar agar mixture over low heat. Stir is constantly till the agar agar dissolves completely. Add the agar agar mixture to the hot milk. Pour the milk into serving bowls or glasses. Put it the fridge for 3-4 hours till it sets. Cut heart shaped jelly with a cookie cutter. Decorate the pudding with the heart shaped jelly. Alternatively you can add chopped jelly to the serving bowls or glasses. Pour the milk mixture over it. Put it in the fridge for 3-4 hours to set. * If you are going to set it with the jelly than you may not want to add the sugar as the jelly is sweet. Use any coloured jelly of your choice to make this cool milk pudding. Try a rose milk flavoured one.I find its an easy pudding to make and a treat during the hot season. Use gelatin instead of agar agar if you like. Serve it with chopped fresh fruit instead of jelly. MayuriDi! I can very much relate to your thoughts but we are happy we have been spending some of most amazing moments with these “Practical” type Men. Loved the milk Pudding with those cute little jelly hearts topping. Wishing you both many more amazing unsaid lovely moments. This is perfect and so delicious Pudding!!!! love this dee. you said it right there are many things in which we will not agree with each other, but though its a love which bind you forever. The feeling of Love is awesome, it keeps us going and facing the world each and every day,roses, chocolates all these doesnot have any value if there is no respect,You are lucky somebody who loves you in his own unique manner. Stay happy and Blessed. Each and every line of this post reminded me of my hubby and how similar he is to yours. The pudding looks pretty with these cute red hearts on it.Happy valentines day! Thanks Waagmi. I've learnt that tolerance of small mistakes and habits makes a marriage workable. Thank you so much Alka for the kind words. Thank you so much Nisa. Its rare to come across men who are romantic :)But practical ones don't tend to beat around the bush, they are direct. Enjoy the day with your lovely girls. Thanks Kriti,I constantly remind my kids(adults now) that love is not all about gifts and material things. Love is doing little things to please your partner. 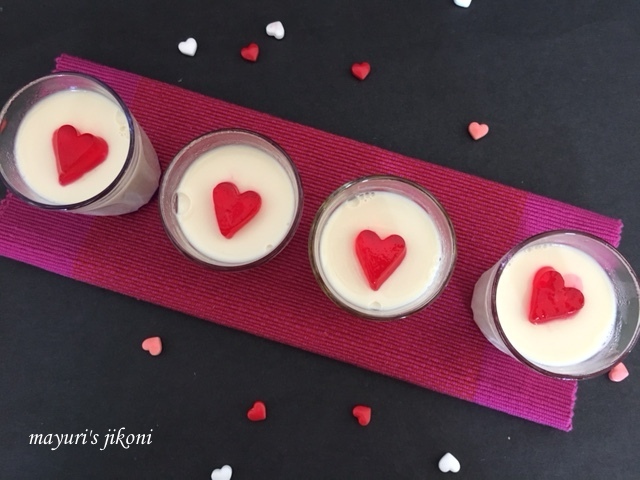 Such a lovely write up.Milk Pudding with cute little red hearts looks fab. So glad to read about the bonding you share with your hubby.Truly Inspiring. very very true… <3 <3 :) thank you for being there always! !